There’s nothing quite like the sound of a speaker doing 180 RPM. The ROTARY MACHINE RM600’s stereo rotary speaker simulations will put a whole new spin on your sound. Rotary speakers were most commonly associated with keyboards and organs when first introduced. But eager guitarists soon wanted to harness this soulful, lively sound for their own purposes. The RM600 instills this appealing sound in stationary speakers, and you can even send signals from this stomp box to two different amps for a stunning stereo effect. With its Real Sound Modeling technology, this stomp box goes beyond approximation for a sound that will have your audience wondering where you’re hiding your spinning speakers! The RM600 simulates Slow and Fast rotation speeds, along with Drive and Drum/Horn blend. Use its two slide switches to select three different ramp speeds and three classic rotary speaker sounds. The bright blue LED tells you when the RM600 is activated. 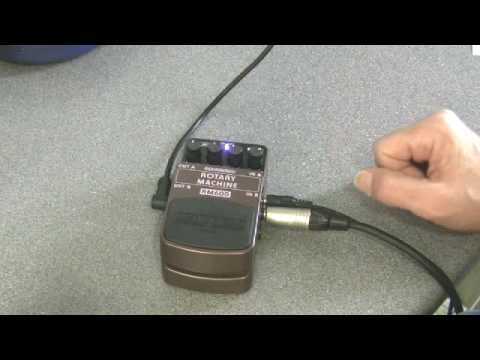 The tough metal footswitch maintains straight-wire signal integrity in bypass mode. You can power this head-turner with a 9 V battery or a DC Power Supply (not included). Start your own sonic revolution—step on the RM600! It will save you money, and trust us—the BEHRINGER RM600 is SO MUCH lighter than a rotary speaker cabinet!